Belair Wings | Just Shooting Memories! It has been a while since I posted photos of classic cars. Mostly because I have been too busy this year to make it to a lot of car shows. I think it had to do with the temperature and that I can not stand the blood boiling heat that we have had in the South this year. In fact, I think the summer time temperatures have been steadily rising since I was a child. I know that isn’t true. I know the real problem is that I’m just getting old. However, I took this shot at one of the First Friday celebrations in Canton. I love the Belair. 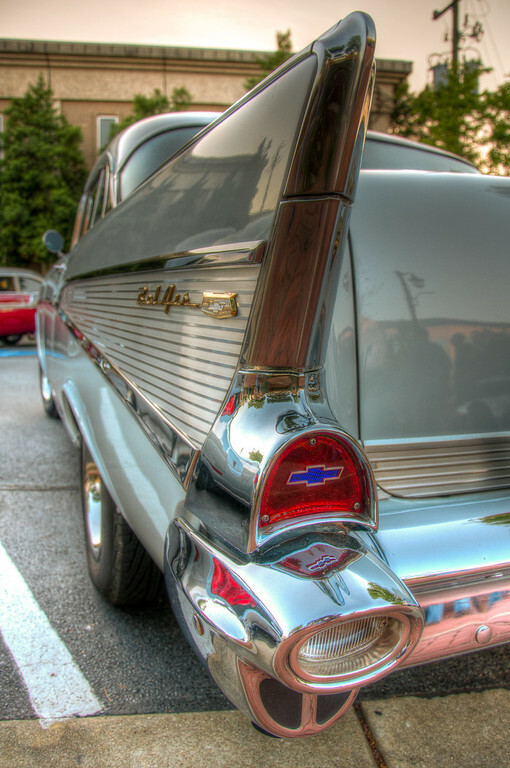 There are very few cars as iconic as the Belair. You’re right. The Belair was one of their best. I especially like the way the lines draw you down to the Chevy logo. The logos in the tail lights are what drew me to the car. They were more purple than I could get here without turning the whole thing purple.